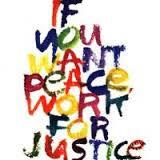 It becomes clear, when everyday people demand peace, justice and freedom… they are not asking for all that much. To begin, we must secure the peace. But our so-called leaders have not bothered for the past 38 years. Instead, the last six presidents have gone to war against smaller and less powerful nations for extraction, extortion, exploitation and worse. This has not been workin’ out real well and it’s time to shift gears. We need to invest in rebuilding the nation, fixing schools, restoring infrastructure and exporting knowledge, technology and peace while we restore and repair the earth. We can find the courage to stand firm against the export of terror, munitions and wars costing trillions and killing millions. We can put people and peace over conquest and chaos to preserve justice in global communities. Freedom is like a flower nurtured in peacetime, which yields justice… sometimes blossoming into joy. To vastly improve your country and truly make it great again, start by choosing a better leader. Do not let the media or the establishment make you pick from the people they choose, but instead choose from those they do not pick. …Pick a peacemaker. One who unites, not divides. A cultured leader who supports the arts and true freedom of speech, not censorship. Pick a leader who will not only bail out banks and airlines, but also families from losing their homes — or jobs due to their companies moving to other countries. Pick a leader who will fund schools, not limit spending on education and allow libraries to close. Pick a leader who chooses diplomacy over war. An honest broker in foreign relations. A leader with integrity, one who says what they mean, keeps their word and does n ot lie to their people. ...Most importantly, a great leader must serve the best interests of the people first, not those of multinational corporations. Human life should never be sacrificed for monetary profit. There are no exceptions. In addition, a leader should always be open to criticism, not silencing dissent. Any leader who does not tolerate criticism from the public is afraid of their dirty hands to be revealed under heavy light. And such a leader is dangerous, because they only feel secure in the darkness. “Thank you for being here today at this conference on climate and militarism, and for leading the charge for a world that works for all of us.